During week two of auditions for the popular reality show America’s Got Talent, audiences were treated to a spectacular performance by modern dance group Eleven Play, who mixed dance with drone piloting. Based in Japan, this talented team of dancers and pilots is headed by choreographer Mikiko, who has worked professionally with musicians such as Suzuka Nakamoto and the Japanese band Perfume. America’s Got Talent has seen its fair share of dancing mixed with technology. In 2015, dance teams Animation Crew, Freckled Sky, Freelusion, and Siro-A all hit the stage. Interacting with animations that were projected onto the stage, the dancers were able to create illusions that were both innovative and mesmerizing. Of course, with so many dance crews utilizing this technology, what was once a fresh idea quickly threatened to become stale. That’s when Eleven Play threw an entirely new flavor into the techno-dance world with their drones. Rather than interacting with projections, these drones were physically present, adding an extra level of challenge for the dancers and backstage pilots. Eleven Play successfully utilized pinpoint precision and timing, which earned them a round of applause from the audience and a “yes” from every judge. With so many new hobbies evolving to include drones—including photography, racing, and builder’s fairs- it was only a matter of time before the world of dance followed suite. Of course, being the first dance group widely known for such an incredible feat is what gives choreographers such as Mikiko a highly competitive edge. Now that America, and the rest of the world, has seen what drones can do for dance, productions from small local theaters all the way to famous Broadway shows are sure to take note! Ladies and gentlemen, start your motors! Welcome to the world of drone racing! Did you know that the first U.S. National Drone Racing Championship was held in 2015? This sport has quickly become a favorite past time for both drone pilots and fans watching from the sidelines- or from their computer screens. camera to their drone and must use only the live video feed to guide their machine through the race track. This creates an exciting challenge, giving the pilot a view as if they’re sitting inside the drone itself, zooming through the race course… and in drone racing, anywhere is a potential race track! Whether it’s through a forest or an abandoned building, on an amateur obstacle course or a professional one, drones can go where other machines can not. Of course, this creates some unique challenges when trying to involve fans. When watching a NASCAR race, viewers can sit in a stadium to watch the cars go around the track. With drones being but a blur through the air, it can be difficult or even impossible for viewers to see them, especially if the drones are heading through buildings. The sport has gained enough attention, however, that financial backers are becoming willing to finance better technology for racing teams so that fans can watch competitions. In fact, in New York, The Drone Racing League was backed for $1 million by Miami Dolphins owner Stephen Ross. So, just how enthusiastic are the fans of this new sport? Enough that winners of big races can earn some seriously sweet cash. The inaugural World Drone Prix was held on March 11th and 12th, 2016, in Dubai. The first place winner, fifteen-year-old Luke Bannister, from England, won a prize totalling $250,000 U.S.
dollars. The total prize pool available to split across all categories was a cool $1 million. If you’re a fan of video games, technology, and racing, try picking up a racing drone today! You never know where your skills will take you! 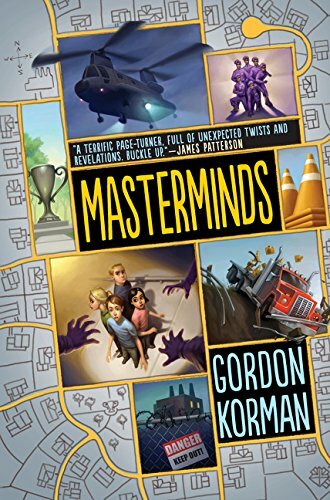 Masterminds, by Gordan Korman, is a new middle-grade novel full of adrenaline-fueled action scenes and jaw-dropping plot twists. In the town of Serenity, New Mexico, kids have everything they need. The town sits like an oasis in the dessert, full of modern homes and swimming pools, tree houses and swing sets. In this blissful community, poverty and crime are unheard of, and the only thing the kids have to worry about is passing their classes at school and what they’ll do in their free time. If only they could leave. Eli Frienden is bored out of his mind. Living in the middle of nowhere, he and his best friend Randy have learned to create their own amusement—but after yet another risky stunt leaves their boomerang caught in the filter of Randy’s swimming pool, Eli thinks the excitment of the afternoon is over. Then Randy confesses that he snuck out of town and found a rusty old car in an abandoned shed. Eli worries that breaking the rules and leaving Serenity will enrage his strict father, who is the mayor of the town, but the promise of adventure lures him into hopping onto his bike and following Randy down the road. That’s when Eli’s life is changed forever. As soon as they pass the town limits, Eli is struck down by a shockwave of pain that sends him crashing to the ground. A black security helicopter appears in the sky above him, and while Eli is taken to the hospital, Randy is punished by being kicked out of Serenity forever. 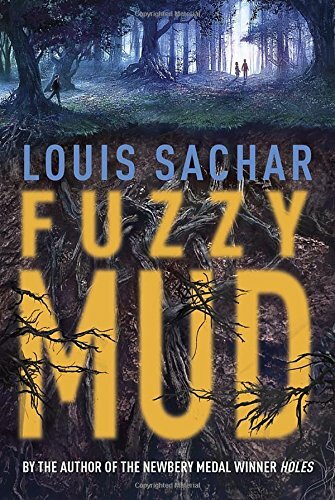 Scrambling for answers, Eli is further shocked when a lightning storm causes a brief glitch that allows him to see a website full of uncensored American history, and he realizes that his entire life has been a lie. With his own father as his greatest enemy, Eli rallies the other kids in his school to break into the Serenity Plastic Works, the factory in town that claims to make orange traffic cones. Once inside, the truth comes crashing down, delivering a unique plot twist that will leave readers stunned. Having learned the gut-wrenching truth of who they are and where they come from, the kids are faced with big questions about the purpose of family and what it means to take control of your own destiny. The kids concoct a plan that sends the action speeding forward, leading to a break-neck finish that will leave readers gasping for a sequel. Author Gordan Korman once again earns his place among top middle-grade writers, weaving a thrilling tale full of expert foreshadowing, relatable characters, and creative plot twists. The work of a practiced and imaginative author, Masterminds is a darkly whimsical tale that will play in the imaginations of readers long after the last page is turned. Learn more about Gordon Korman and his books!